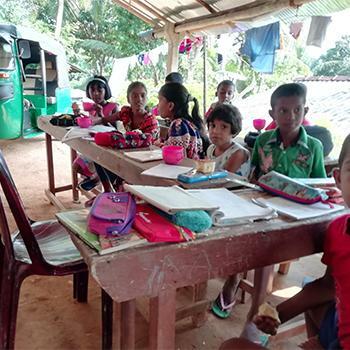 We sat with the children to observe their progress and the teaching method of their tutor. The children enjoyed our company with smiles. It was all business when the tutor called the class to order and began working with the children. She wrote a word on the board and the children had to read it aloud. If a child did not pronounce the word correctly, the tutor would correct the child until they got it right. The children had to also give the meaning of the word. It is a tough job for the tutor to keep the children silent while the teaching is going on. We also noticed her love and care for the children, which makes a big difference and motivates the children to stay interested in their studies. During the tea break, cakes and tea were served. We asked the children about their tutor and they all praised her, saying, “She loves us so much, and we love her. Her teaching has made us achieve high marks in school.” They thanked us and GHNI for the tutoring class. *For purposes of security, “WR Village” is a pseudonym for the village being helped.